On Radio 4 on 26 August 2015 Quentin Letts asked “What’s the point of the Book of Common Prayer?” This little book, written by Archbishop Thomas Cranmer, was originally published in 1549 during the brief but emphatically protestant reign of King Edward VI. For centuries it was universally used in the Church of England, providing not just prayers but the orders of service for baptisms, marriages and communion. In the last fifty years or so it has been mostly superseded by versions written in modern English. Letts’ programme acknowledges that it tends to attract “people who don’t much care for the modern world”, but those who love it are not simply clinging to the past. In the eighteenth century Dr Samuel Johnson commented that is “the genuine language of piety impregnated by wisdom”, and in the programme writer and theatre director James Runcie claimed “You don’t understand English literature without the Book of Common Prayer, the Bible and Shakespeare”. The words of the Book of Common Prayer have gone deep into the minds of many writers. There have been a number of attempts to define Shakespeare’s own debt to this little book. 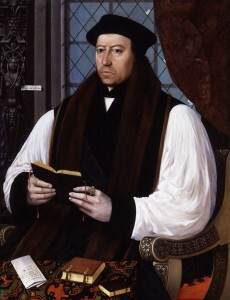 Every time he attended church he would have heard Cranmer’s prose, and like most people he probably knew the book by heart, having heard it repeated throughout his life. 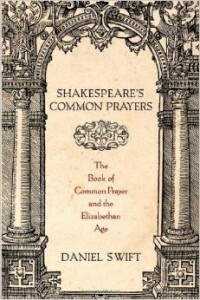 In his 2012 book Shakespeare’s Common Prayers: The Book of Common Prayer and the Elizabethan Age, reviewed here, Daniel Swift agrees that the book’s influence has been neglected… “neither the Bible nor the Book of Common Prayer are mentioned in Bullough’s six-volume collection of Narrative and Dramatic Sources of Shakespeare” or other books looking at Shakespeare’s sources. “For Bullough, as for the generations of literary scholars who have relied on his invaluable resource, the sources of Shakespeare are specifically nondevotional”. Bullough reproduces whole narratives: “here are these old stories, they say, waiting for the magic of his touch. The source not only precedes the play: it is transformed and improved by it”. Swift calls for “a messier and more engaged definition of a source”. Others who have looked at the subject include Margot Thompson whose booklet The Prayer Book, Shakespeare and the English Language has been published by the Prayer Book Society which also has a page on the subject containing a link to a programme by Melvyn Bragg that looks at the book’s importance. A tantalising copy of the Book of Common Prayer is owned by the Shakespeare Birthplace Trust. 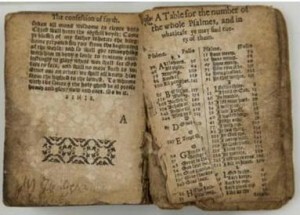 The copy contains the 1559 edition of the book together with the psalms that first appeared in 1594, and the whole book was printed in 1596 by Christopher Barker, the official printer to Queen Elizabeth. What makes the copy special is that it contains two signatures by W Shakespeare or William Shakespeare. A post was written by Pete Hewitt on the SBT’s Finding Shakespeare blog a few years ago that sadly concludes these signatures are almost certainly forged, perhaps from the hands of the infamous forger William Henry Ireland (1775-1835). There is also a mention of the book on the SBT’s Treasures page. Zoomable photographs of this fragile volume are on the Windows on Warwickshire website, as are photographs of many other fascinating items relating to Shakespeare. It’s maybe not, then, the book that Daniel is hoping to find, but another of the many forgeries that demonstrate the desperation of some at the end of the eighteenth century to find Shakespeare memorabilia. The little book, heavily worn and clearly much used, is still a treasure, demonstrating how important the liturgy was to people, heard on their weekly visits to church and part of their everyday lives. People for whom the book was, to quote Quentin Letts, the “popular poetry of the English language”, its rhythms and phrases known by heart. This entry was posted in Legacy, Shakespeare's World, Sources and tagged Daniel Swift, Prayer Book Society, Quentin Letts, Samuel Johnson, Shakespeare Birthplace Trust, Thomas Cranmer, Windows on Warwickshire. Bookmark the permalink. Very fascinating insights into Shakespeare and The Book of Common Prayer. Thanks for sharing these valuable details. Thank you for your kind comment, I’m glad you enjoyed the post! I have just heard the BBCR4 Quentin Letts programme – I thought it was rather good. I have read the Bragg book referred to. I visited the Shakespeare birthplace “museum” last month. There was a noticeable lack of books – I had to ask more. Obviously, in the grammar school he attended, books being rare and expensive, I guess they copied and learnt by rote. At this point, we refer to the oral tradition – church, school and of course home, since his father was successful but could not read and write. We add to that all those questions (unsettled?) regarding the household’s attitude to the authorized church, its various hard line forms, authority, Rome, texts and liturgy. Do we come out thinking there must have been a nuanced and flexible sensitivity plus a survival instinct mixed with some secrecy? Your blog opens a door on this rich and possible major defining source and I, like others, thank you for this. Thank you very much for your comment. As a librarian by profession I always love to see books on display too. There were books in the town: from memory, there’s a reference to at least one being left to the school, and lots of books are mentioned in one contemporary will.